Senior educationists has summarized the policy to implement in next few days. The educationist have explained that the purpose of this recruitment is to bring better results in the schools. Vacancies : Educators Jobs 2017 For Science and Arts Teacher For All District Govt School This news is very fortunate for the educated people in Punjab, who are seeking government jobs for years. 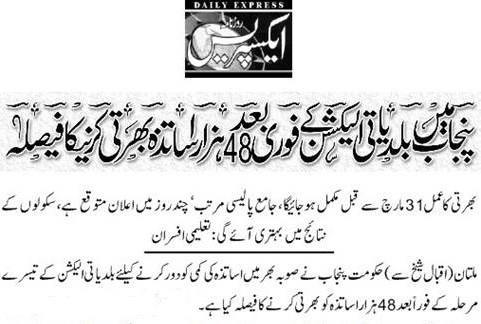 Now, 48,000 people will be eligible to get their jobs by decreasing the unemployment rate in Punjab. The wonderful credit goes to the Punjab government by recruiting the people in the education department in start of 2017. Lecturers ki jobs kB ain hi?